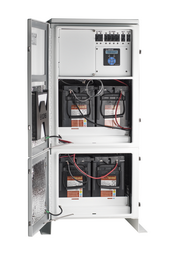 SENS MicroCab™ 1500 is a rugged, modular outdoor DC power system / DC UPS. The system features both expandable charging and battery capacity. MicroGenius™ 2 high efficiency switchmode rectifier/chargers deliver up to 45A at either 12 or 24 volts. Up to three rectifiers operate in parallel, providing seamless power expansion or redundancy to meet high availability requirements. Battery capacity is expanded by the use of an expansion bay integrated below the base unit. Users may select from a variety of VRLA batteries, including special high temperature rated batteries. All systems include Modbus over RS-485, with optional TCP/IP support. Standard Form C contacts annunciate summary, major, and minor alarms.